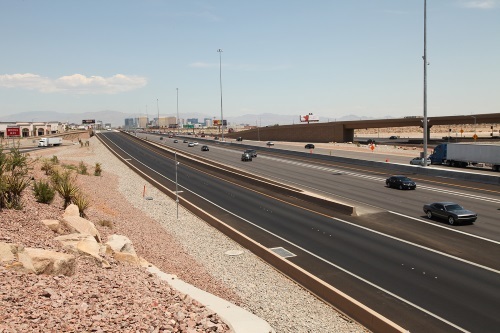 A pilot program that combines in-vehicle and city data with predictive analytics has reduced primary crashes by 17 percent along a key corridor of Interstate 15 in Las Vegas — without requiring any additional resources from state or local agencies,according to a statement by the Regional Transportation Commission of Southern Nevada. The project – which involves the RTC, the Nevada Highway Patrol, the Nevada Department of Transportation, and technology provider Waycare – “dynamically identifies”areas of roads at “high risk” for an incident, then allocates “preventative measures” to those areas accordingly, such as cautionary driver warnings displayed on message boards coupled with a more visible law enforcement presence, explained Tony Illia, a Nevada DOT spokesman. For example, during the program, 91 percent of drivers traveling at over 65 miles per hour reduced their speed to below 65 mph in areas where preventative measures were deployed, he said. It’s also helping generate data the agency said it can use as part of its ongoing efforts to enable connected and autonomous vehicles or CAVs to communicate and share vital transportation information between roads, infrastructure, and other vehicles. The program functions via a four-step process, according to Waycare. First, the company’s technology platform uses in-vehicle information and municipal traffic data to understand road conditions in real-time. Second, when it identifies an area at high-risk for an incident, Waycare’s system alerts traffic agencies to when and where preventative action is required. Third, the RTC uses message boards to deliver a “preliminary warning,” alerting drivers to reduce speed and drive cautiously. Finally, the NHP proactively positions its vehicles in “high-visibility mode” along the freeway in conjunction with Nevada DOT, which insures safety barriers are in place to protect police officers on freeways. “The results of this pilot program are a clear signal that AI [artificial intelligence] and deep learning, when deployed in collaboration with traffic management and enforcement agencies, can have a dramatic impact on improving the safety of even our busiest and most at-risk freeways,” said Noam Maital, co-founder and CEO of Waycare, in a statement. “Traditionally, law enforcement has relied on anecdotal evidence to determine where to deploy resources to respond to traffic related issues,” added Lieutenant Colonel Daniel Solow, Nevada Highway Patrol.